$125 for * Shipping And Handling, includes Insurance. All Senville models enjoy the added function of inverter technology, specially designed to reduce energy costs, and power surges. Inverter Technology on Senville models helps to maintain a constant flow of power, ensuring comfortable and quiet cooling, while keeping costs down. R410A is the most environmental friendly refrigerant available on ductless and split air conditioners. All Senville models enjoy the added benefit of R410A refrigerant and are per-charged and ready for effortless installation. Backed by a 5 Year Warranty on compressors and a 1 year warranty on parts, the Senville Leto Series provides you with peace of mind, knowing your air conditioner will last a lifetime. Senville proudly backs its product by its industry standard warranty, and knows that manufacturing and craftsmanship will live up to the Senville name. Understanding how to make tomorrow more comfortable, efficient and eco-friendly relies on the understanding of where we need to be technologically today and Senville, the world’s premier source for ductless air conditioners, is allocating their every strength in its international research laboratories and production sectors to provide the consumer with high quality products. Simply researching isn’t enough, however; we constantly take every step fathomable to increase our production efficiency while improving the overall quality of our mini split and other ductless lines of air conditioners. Cooling down or staying warm is more than just effort for Senville when producing our mini split air conditioner heat pumps. We put great effort into each produced ductless air conditioning unit and back it with our superb 5 year warranty for your benefit. Many customers choose us for the excellent customer service we provide every step of the way. In the end, they simply choose us for their heating and cooling needs for our approach to flawless design and usability. With over 20 years in the industry, we understand the industry well and, through the design of our ecological-friendly mini split air conditioners, you’ll see we also have an affinity for the ‘Green’ side of life. Overall, we provide safe, secure and sturdy products backed by a world renowned company thousands of customers have come to trust and count on year-round in Senville. We use a different sort of ‘magic’ that replaces the CFC’s of old which allow for an atmospherically friendly product that lasts a lifetime. Senville wasn’t created by coincidence; we understand that consumers have wants, needs, and financial constraints to consider when purchasing a new ductless air conditioner or mini split. 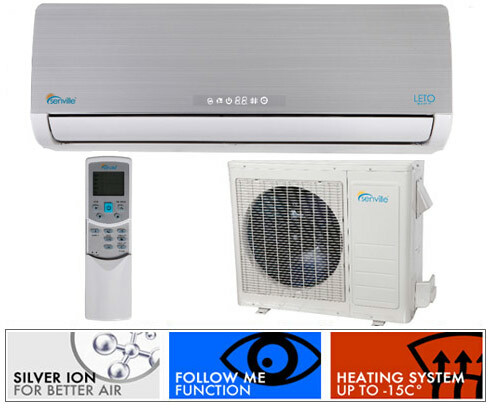 Therefore, we simply won’t build any unit for your home – we’ll create the perfect ductless or mini split air conditioning unit that fits your home or business needs like a glove without giving you more or less than is really necessary. Carrying such accreditations like CE, CSA, UL, ETL, ISO9001, and ISO14001 should give you an idea how we take quality, safety and superior design seriously around the Senville office. We are a caring, loving and logical manufacturer of air conditioning units you want. We are Senville. Do Senville units require any maintenance? The air filters located on the indoor unit should be cleaned bi-weekly depending on usage. The air filter can be accessed easily and use damp cloth to clean. This will allow efficient air passage through the unit during all seasons. No cleaning products are required. When the unit is not operational, use the supplied Senville covers on the outdoor unit. This will prevent any outdoor surroundings such as dust from entering the outdoor unit. 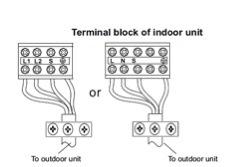 What is the maximum length between the indoor and outdoor unit? I have added additional Copper tubing; how much more refrigerant (R410A) is needed? 1). Connect the charge hose to the charging cylinder, open the 2-way valve and the 3-way valve. Connect the charge hose which you disconnected from the vacuum pump to the valve at the bottom of the cylinder. If the refrigerant is R410A, make the cylinder bottom up to ensure the liquid charge. 2). Purge the air from the charge hose. Open the valve at the bottom of the cylinder and press the check valve on the charge set to purge the air (be careful of the liquid refrigerant). 3) Put the charging cylinder onto the electronic scale and record the weight. 4) Operate the air conditioner at the cooling mode. 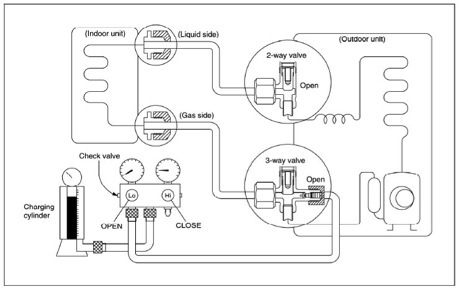 5) Open the valves (Low side) on the charge set and charge the system with liquid refrigerant. 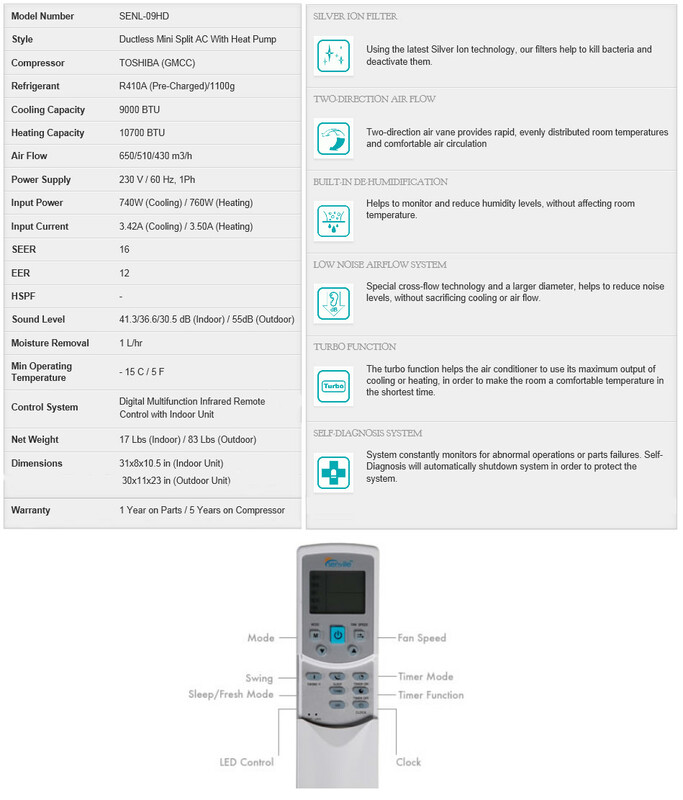 6).When the electronic scale displays the proper weight (refer to the table), disconnect the charge hose from the 3-way valve’s service port immediately and turn off the air conditioner before disconnecting the hose. Use torque wrench to tighten the service port cap to a torque of 18N.m. Be sure to check for gas leakage. The cable size and the current of the fuse or switch are determined by the maximum current indicated on the nameplate which located on the side panel of the unit. Please refer to the nameplate before selecting the cable, fuse and switch.